I have tried many, many times to write this post and every time I start to write it, it isn’t a very sunny post. Usually when I write in my little part of the universe, I write with a mixture of wonder, awe, amazement, optimism, self-deprecation and a bit of humour. This time, though, I feel great sadness and anger and, try as I might, the anger has not dissipated in the weeks it has taken to write this post. The mother and godmother of Alex Spourdalakis killed him. Alex was 14 and autistic. They tried to drug him and when that didn’t work he was stabbed to death. The two women also attemped to kill themselves, but were unsuccessful. They did manage to kill the family cat. That was necessary so that the cat didn’t end up in a shelter, apparently. The situation ought to make any of us sad. Before his death I had never heard of Alex, although his story was already notorious among a great many people in the autism and special needs communities. His mother had put him on display as a child who should be treated medically for autism. She had taken him to a number of hospitals to have him treated for gut issues. There were pictures circulating on the web of a nearly naked Alex in restraints on a hospital bed and the mother claimed that doctors were refusing to treat her son or were mistreating him. He became a poster child for parents and groups who want to cure autistic people. Folks used Alex’s story–actually, his mother’s story–to describe medical indifference, ignorance and obstruction, while trotting out disgraced and de-certified former doctor Andrew Wakefield, the guy who did so much to whip up the spurious link between vaccines and autism. Frankly, I have stopped reading the many sites where the great vaccine-autism myth is debated. I have common cause and empathy for all parents who are trying to sort out how to raise an autistic child to adulthood. I am a little too old, however, to feel comfortable reading post after post, comment after comment where parents say they hate autism. It doesn’t take long before hating autism starts to look very ugly to me. And here’s where the bulk of my feelings of anger come in. If only I hadn’t looked at the comments, I wouldn’t now know that there are many folks extant in the world who think that Alex’s mother is a victim here. The arguments go along these lines: she had no where to turn for help; no one was listening to her; the medical establishment wasn’t treating Alex correctly; he was a burden. My own favourite was that his actions were communicating how much pain he was in and wanted the suffering to end. Yes, I have actually read a couple of statements like that. If you dig around long enough you will find them. As a Canadian of a certain age, I am reminded of the Tracy Latimer case. Tracy had cerebral palsy and lived in pain. One day, her father fed a hose from the exhaust pipe of his truck into the cab of the truck where Tracy was. Her last breaths on this planet were filled with enough carbon monoxide to kill her. Her father told police that she died in her sleep, but that version didn’t hold up long. The case eventually resulted in a second degree murder conviction. At one point he admitted to thinking of other ways to kill her, including shooting her. Yet, he maintains to this day that he acted out of mercy to end her suffering. There are millions of Canadians who agree with him. I am not one of those Canadians. He murdered her. If he felt she was suffering, he had other options, including turning her over to CAS. Instead, in my simple world view, he acted cowardly and betrayed her. He thought her life was less than his. Alex’s mother and godmother thought the same thing. Their defenders will say that she didn’t want to institutionalize him. Some say institutionalizing him would have been inhuman and not met his needs. There are folks who are writing that we only have the media version to go on here and we can’t possibly judge her. To which I say; expletive, I am never going to put myself in the shoes of a parent who thinks that their child is a burden and the only way out is to cowardly kill them. These are not children we can just throw out when we think they have passed their best before date. None of our children are disposable. One question remains for me: who asked Alex if he preferred to be dead or autistic? Emma’s Hope Book: But What About Alex? Someone on the spectrum might have a very different take how I am writing this post. Here are two posts that are very moving and offer a very different take on the issues. 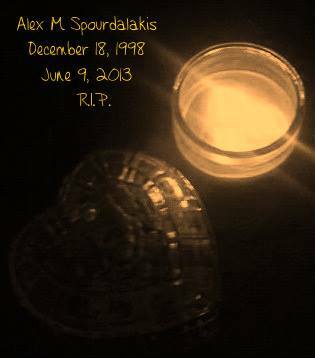 There are a lot of powerful words and images on the Facebook Page Autistic Community Vigil in Memory of Alex Spourdalakis. In fact, the image in this post came from that page.